The Printmaker's Cat - published by Mascot Media in June. I have 6 of my prints in this new edition. 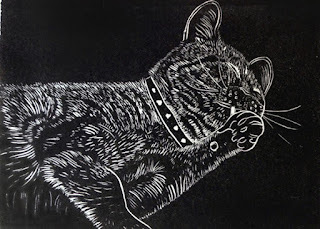 This is a sample of the text and a lino print of 'Cat licking its paw'. the excitement of the ‘reveal’ of printmaking”. when creating her cat prints. You are welcome to my Open Studio event on Saturday 27 June, 10.30-4pm. I will have a range of original prints (etchings, lino prints, collagraphs, monotypes), paintings and greetings cards for sale. I am happy to tell you what inspired my work and explain how I made it. If the weather is fine you may also wish to step out of the studio into the garden to admire some of the plants and flowers that feature in some of my work. Coffee, juice and homemade cakes will be awaiting you! Let me know if you plan to come and I will send you directions and make another cake! Are you in central London in June? 10am - 5pm daily (closes 3pm on 13th June). If you haven't been to the Mall Galleries before, they are just by Admiralty Arch, close to Trafalgar Square. If you can't make it to the exhibition, my etchings will be on show in the Society's on-line Galleries in June. 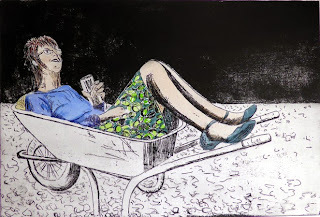 A friend of mine told me that it was his favourite way of looking up at the sky - he had difficulties bending his neck so much preferred the wheelbarrow to a chair. 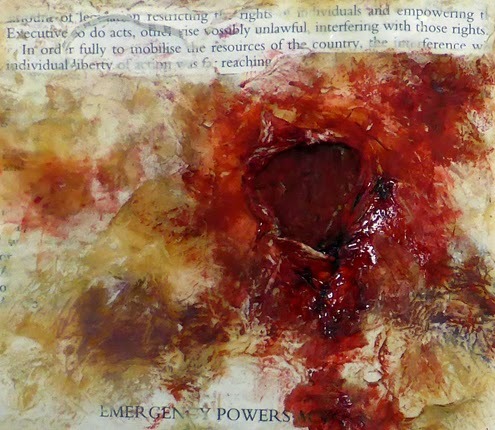 In my volume of Halsbury Statutes, I have scarred and bloodied the surface of the pages to symbolise the effects of war. 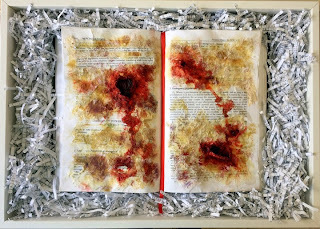 The shredded statutes represent the suspension, or tearing up, of laws. 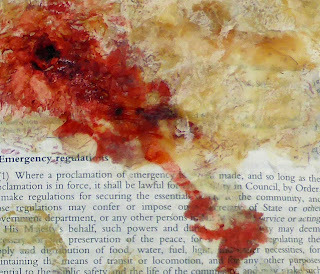 In the case of a declaration of war or a national emergency, laws and ‘due process’ can be suspended in the interests of maintaining the safety of the realm. This could involve what would otherwise be considered infringements of personal liberty, such as imprisonment without charge. The Magna Carta has become a great symbol of personal liberty and an important landmark for the idea of protecting people from illegal imprisonment and providing access to justice. However, the proposed transfer of power away from the monarch to the barons in 1215 was to apply only to nobles not to ordinary people! 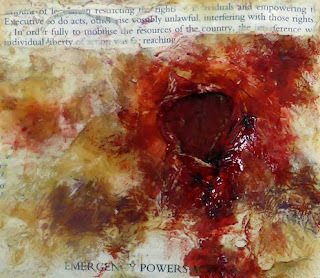 In my volume, I have scarred and bloodied the surface of the pages to symbolise the effects of war. The shredded statutes represent the suspension, or tearing up, of laws. 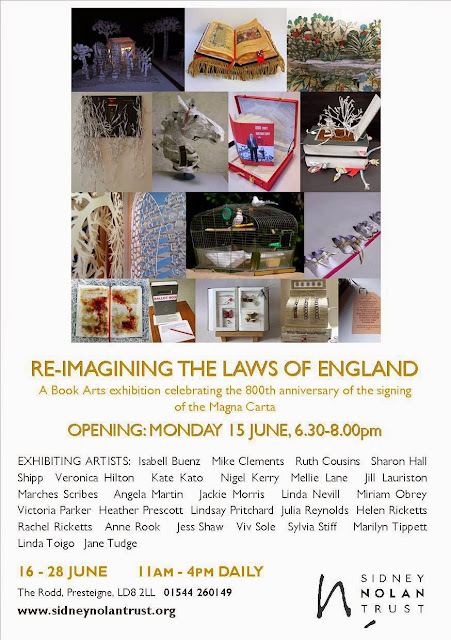 The exhibition opens on 15th June 2015 at the Rodd, Sidney Nolan Trust, Presteigne.